Majesco Entertainment of Zumba Dance fame are working on a new endless castle defense game called Romans from Mars that should have fans of the genre pretty excited. 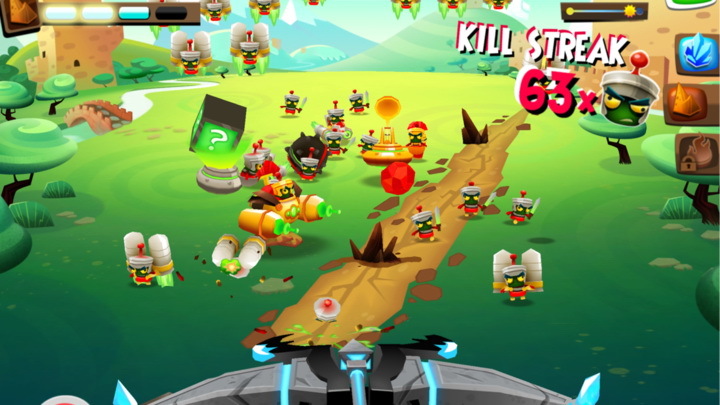 The game features endless castle defense as players are required to deal with waves upon waves of martians who are having a good go at the poor earthlings. The game isn’t a sci-fi game, but rather a colorful cartoony one bringing in some ancient Godly elements in the form of Jupiter and Mars. This fun game came about as a result of a huge tiff between the King of Gods, Jupiter and the God of War Mars. Mars is banished to the planet of the same name and he decides to get even with Jupiter by training the martians and sending them over to earth to cause destruction and chaos. And the only one who stands tall and ready to fight for Jupiter and his castle is You. Armed with a crossbow, you have to frantically tap across the screen to unleash scores of arrows, and other powerful powers (probably borrowed from Jupiter) such as lightning bolts to tackle waves of martian armies. As with most defense games, the enemy waves start off slowly but eventually builds up to a powerful crescendo leading to some pretty intense and cataclysmic fun. The game will feature ten types of enemies each carrying their unique powers and weaknesses. Players will have to judge and and time their attacks according to the enemy movement patterns and attacking styles. There will also be plenty of powerups to help deal with hordes of martians and they can be purchased with in-game currency as well as real world cash. This free-to-play game is expected to launch some time in October. While you keep your eyes open for more news and events on Romans from Mars in the coming days, enjoy these brilliant screenshots.